Donald W. Webb was born and raised in a coal mining camp known as Hot Spot, near Whitesburg, in Letcher County, Kentucky. After graduating from Whitesburg High School in 1956, he attended Virginia Military Institute and graduated from Georgetown College in 1960. He was married to Julie Howser Webb in 1964 in Frankfort, Kentucky. Don joined the Kentucky Department of Economic Development, acquiring extensive experience in community and industrial development through active participation in statewide development programs. He attended the University of Kentucky College of Law earning a JD degree in 1967. During this period, he retained his position as Special Assistant to the Commissioner of that Department. He served in the Kentucky National Guard. In June 1967, Webb was named as Special Assistant on the White House staff in Washington DC, where he served as legal advisor to the National Advisory Commission on Civil Disorders, investigating riots in various cities throughout the nation. Upon completion of this assignment in 1968, Webb returned to Kentucky where he co-directed the unsuccessful campaign of Katherine Peden for the United States Senate. Mr. Webb practiced law with the Louisville firm of Handmaker, Weber & Meyer until 1971, when he and his brother, Dudley, formed a law partnership in Lexington. Concurrently, the two brothers began a real estate involvement. In 1972, this firm became The Webb Companies, a consolidation of their real estate development, design, finance, legal, construction, marketing, leasing, brokerage, property management, and ancillary functions. The Webbs developed nearly 5.5 million square feet of office, warehouse, residential and shopping center buildings in Fayette County, Kentucky, with assessed values of hundreds of millions of dollars. Webb projects literally changed the face of downtown Lexington with their office towers, specialty centers and condominiums. The Webb Companies was recognized as the nation’s third largest diversified real estate developer in 1986. It developed real estate projects in more than 20 American cities. In 1979, Webb, along with Dr. Ed Nighbert, Dudley Webb and thirty-eight Lexington physicians, was a founder of the Lexington Surgery Center, one of the nation’s early free-standing outpatient surgery centers. This facility became the flagship of Surgical Care Affiliates prior to its acquisition by Health South. Mr. Webb served on the Board of Surgical Care Affiliates. Donald Webb had many civic interests in Lexington and Kentucky. He served on the boards of the Kentucky Economic Development Corporation, the Central Kentucky Blood Center, the Fayette County Medical Society Foundation, Inc., the Kentucky Horse Park Commission, Leadership Kentucky, American Cancer Society, “The Nest” Child Abuse Center, the Lexington Economic Development Commission, Lexington United, the Bluegrass Association for Retarded Citizens, Humana Hospital, Good Samaritan Hospital, Triangle Foundation, Fund for the Arts, First Security National Bank and Trust, and was the primary founder of the Lexington Trolley Company and the Downtown Lexington Corporation. Don served as Chairman of the Greater Lexington Chamber of Commerce, Chairman of the Fayette County Democratic Party and as Kentucky Chairman of the American Cancer Society. He also served on the Board of Directors of the University of Kentucky Alumni Association, as a member of the Visiting Committee of the University of Kentucky College of Law, as the Director of the Business Partnership Foundation of the Kentucky College of Business and Economics, was a UK Fellow and was a former Director of the Kappa Alpha Order Education Foundation. Donald W. Webb passed away on July 19, 2013 at the age of 74, but his legacy lives on. The Webb Companies remains a family-run business. 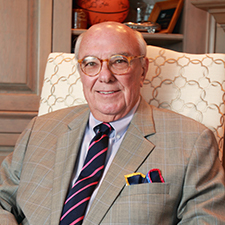 Mr. Webb’s brother and co-founder of The Webb Companies, R. Dudley Webb, continues to serve as Chairman of The Webb Companies, while his son, Woodford Webb currently serves as President and is responsible for the business affairs of the company. Donald Webb is survived by his wife, Julie Howser Webb, son and daughter-in-law, Donald Woodford Webb, Jr. (Woodford) and Dr. Kelli Greer Webb and his grandchildren.